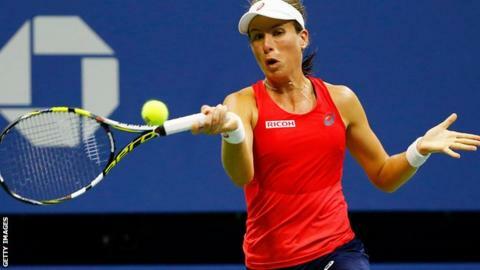 Great Britain's Johanna Konta beat German world number 17 Andrea Petkovic 6-4 7-5 to advance to the second round of the Wuhan Open in China. The 24-year-old will meet Belarusian Victoria Azarenka after her second win of the season over the 2014 French Open semi-finalist. World number 63 Konta has now won 19 of her last 20 matches since losing to Maria Sharapova at Wimbledon. She is within four ranking places of British number one Heather Watson. Watson, who like Konta came through two rounds of qualifying in Wuhan, plays Serbia's former world number one Jelena Jankovic on Monday.